For over 25 years, the Alliance for Children’s Rights has been helping children who are struggling in foster care to join families, recover from trauma, thrive in school and make a healthy transition to adulthood. 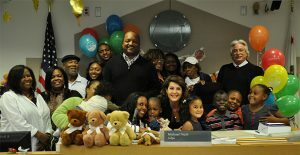 To date, the organization has served nearly 150,000 children in greater Los Angeles. You can be part of the future for these vulnerable young people. Making a bequest to the Alliance for Children’s Rights is a simple way to ensure that we can continue this vital work on behalf of the next generation. You can name the Alliance as a beneficiary of your will, trust, retirement plan, life insurance policy or financial account, or fund a charitable gift annuity or trust that may provide you with tax benefits and income. Find out more. Please let us know that you’ve included the Alliance in your estate plans. The Alliance’s Federal Tax ID is # 95-435-8213. Before finalizing your charitable plans we encourage you to seek the counsel of your legal or financial advisor.